UPDATES: For "Anwar wants Musa Hassan to join PKR, not PAS" and other revelations, please read Former IGP bombarded with questions of the past featuring bloggers from Gelagat Anwar to former Information Minister Zainudin Maidin. Those who were hoping that the ex-IGP would continue to slam politicians in the ruling Government were absolutely disappointed yesterday. 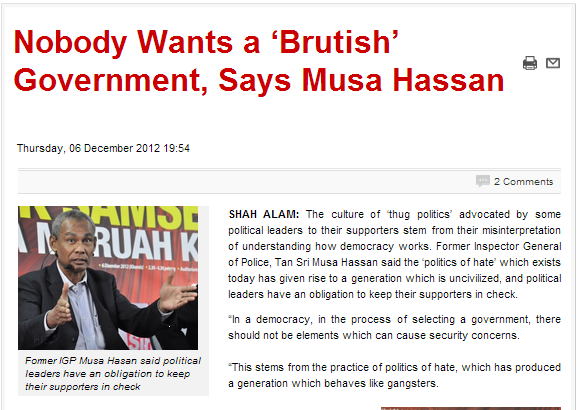 The Tan Sri stuck to the forum's topic and whacked all political gangsters. Not too far from where the forum was held, a prominent Selangor politician was threatening to dismantle traffic cameras in the state in a blatant display of power, something Malaysians have been seeing a bit too often lately. Let's see how quick those who have waited for so long to be the first to jump with rebuttal whenever Rocky comes out with a new entry.. Here he goes again. 5 years back everything the government did were wrong even they may be good but today everything the government does no matter how bad are still good for him. You guys notice the difference? as usual, it is a very witty combination of two separate issues merging with the main plot. one that said of political change via demonstration while the other about dispute of policies. but then, the general reading population and the state of our education up bringing have brought most to a level of accepting anything that is in paper as the gospel truth. we dont question critically, and we do tend to get our emotions in and challenging on a personal level. in short, there is simply no relevancy to the two issues mentioned here. Who were the thugs under?Umno youth.And Umno youth is under who?Which political party?Go figure,rocky.Hehehe. Dismantling AES cameras is brutish behavior ? Really ? Any blood spilled except for the bloodsucking Beta Tegap ? Stop talking nonsense Rocky. You never used to cry wolf until recently. Baling batu sorok tangan. Tak malu ke ? Latuk....did u achieve the KPI as set on you when the two cousin sent you as a messenger to neutralise a former mattress carrier now turned a recalcitrant? Sorry I had to not publish your "smelly" comment. Be a good sport and respond politely to Shalela or diam saja.